The coolest thing about the cover artwork for Queen's 1977 album News of the World was that it was inspired by a cover from the October 1953 edition of Astounding Science Fiction magazine (later called Analog). The caption for the image was "Please... fix it, Daddy?" Drummer Roger Taylor brought this to the band's attention, and they decided to gank it for their next cover. They contacted the artist of the original piece, Frank Kelly Freas, who painted the cover based on his own work. 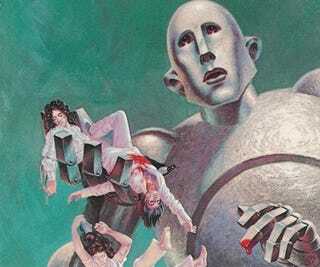 It features Freddie Mercury and Brian May dead in the robot's giant hand, while Taylor and bassist John Deacon plummet to the ground. It's definitely one of Queen's most identifiable album covers, which also contained the hits "We Will Rock You" and "We Are The Champions." Artist Frank Kelly Freas was involved in the science fiction field from 1950, until his death in 2005. He painted everything from pieces for NASA, to book covers, to magazine covers, to buxom beauties as nose art on fighter planes to Mad Magazine, and even the covers for the GURPS books for Lensman and Planet Krishna. He won numerous awards, and was often hailed of "The Dean of Science Fiction Artists." You can check out his awards, browse his art, and even buy pieces of his work at his website, which is chock full of information including a brief documentary by his wife Laura.